As I look back on these Retro Recipes, I see a disappointing lack of that most vilified and clichéd of retro dishes: the casserole. Every family from 1950 onwards seems to have a standard casserole recipe, ready to be whipped out for church banquets, last minute company suppers, and family reunions. Whether it involves cream of mushroom or cream of chicken, celery or pineapple, these recipes were passed along through the years, perhaps with a few notes scribbled in margins: "Add a can of bamboo shoots!" "Needs more vinegar!". My own family is no different, which is why I am here today to bring you the secret behind the storied success of the Morat/Secchi/Butler clan: tagliarini. Now, normally I would be skittish of any meal involving creamed corn, tomato sauce, black olives, and hamburger, but this one is beloved way beyond my own family. I've run across a variation of this recipe in numerous books, most often named "Italian Casserole" or "Italian Delight." Favorite Mormon Recipes: Meats (buy on Amazon ) features four recipes for similar casseroles, including the alluringly titled Picnic Meal in a Jug (last sentence: "Pour into gallon vacuum bottle"). The only mention I can find of a casserole like this actually called "tagliarini" is in Rita Van Amber's compendium Stories and Recipes of the Great Depression (buy on Amazon ). When I called my (Italian) grandmother to check if I had the recipe right, she told me that she got the recipe back in the 50s from some non-Italian family friends, who called it "I-tagliarini." Regardless of the name, it's an old recipe, designed to feed a crowd of hungry people as cheaply as possible. Casseroles as thrifty crowd-pleasers might be a relatively new invention, but the idea of slow cooking ingredients in a shallow dish has been around since ancient times. In fact, "casserole" refers to the cooking dish as well as the finished product. The word first appeared in print in English in 1708, and Fannie Farmer's 1896 Boston Cooking School Cookbook featured a recipe for a casserole of rice and meat, steamed and served with tomato sauce. Since then, the casserole has made appearances in American kitchens during hard times, including the Great Depression and both World Wars. I, for one, would like to see another casserole renaissance. All the ingredients for my tagliarini came to under twenty dollars, which brings the final total in at $2.50 a serving. Recessionista cooking, indeed. Like most American casserole recipes, tagliarini is a snap to make as long as you have a functioning can opener. I browned a pound of hamburger, then added a chopped white onion and some chopped garlic, cooking that with the hamburger until the onion was translucent. 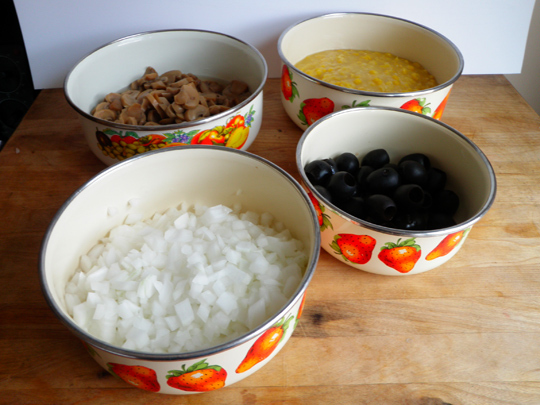 And then the cans: one each of creamed corn, whole kernel corn, and black pitted whole olives. Next I put in three small cans of sliced button mushrooms, and two cans of tomato sauce, plus one can's worth of water per my grandma's advice ("I like mine a little soupy"). I also put in a few shakes of Tabasco sauce, because I enjoy a little extra spice in my tagliarini. I stirred well, then let the whole thing cook for about 20 minutes, bubbling away while I boiled a package of egg noodles till al dente. I drained the noodles, mixed them in with the sauce, and spread the mixture out in an ungreased baking dish. Grate a little sharp cheddar on top, popped it in a 350 oven, and 45 minutes later I was ready to recreate a little piece of my childhood. Maybe it's the creamed corn, or the egg noodles, or the Tabasco. Probably all that sodium has a great deal to do with it. I don't know what it is, but tagliarini still gets me every time. The crusty edges, the cheesy top, the occasional olive all contribute to a culinary experience par excellence. All you need is a cold glass of milk and some green salad to round things out, and you'll have a recession-friendly dinner for you and seven of your closest friends. It'd help matters if you had a slice of my grandma's grasshopper pie for dessert, but that recipe will have to wait for another time. Preheat oven to 350 degrees. Cook noodles as directed. Brown hamburger, when it is cooked, add chopped onion and garlic. Cook until onion is translucent, season with salt and pepper. 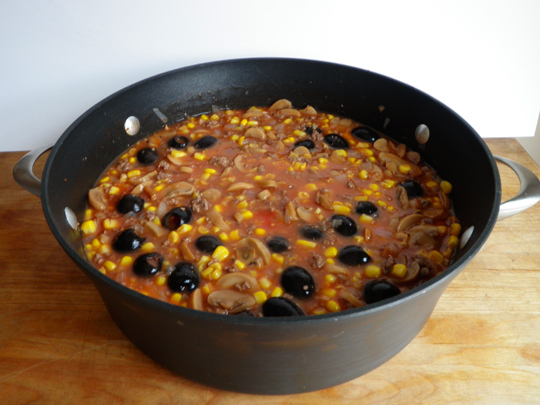 Add olives, mushrooms, corn, tomato sauce, and one sauce can's worth of water, let cook for 15-20 minutes. 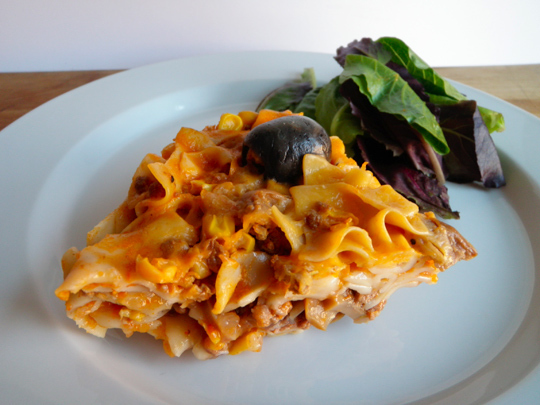 Stir in noodles and season to taste, then spread in baking dish and top with grated cheese. Cover with foil, cook 45 minutes or until edges bubble and cheese melts. Thanks for this. I could substitute tofu or non meat product, and it sounds easy...I love this column and check it out every new recipe!! Minus the olives and add a scoop of chili seasoning, and you have my family recipe for "glob stew." Everyone still loves it. You have to try King Ranch Casserole next time, it's very very good. My mom's go-to casserole was called "Sicilian Supper," and may have involved cream cheese. But hot damn, it was good. That sounds so simple and looks really good!